Under this heading, PIA will occasionally post new information about essential oils, short essays about cultural aspects of essential oils, unusual blend suggestions and general information that might be of interest to an aromatherapy enthusiast. On this page PIA will also offer, in loose sequence and for a small charge, instructional materials for online viewing (or also pdf download). A sample post to show what is to come for PIA Online members. Today most of the cultivated areas of Provence are planted with different types of Lavandin, a hybrid between True (Lavandula angustifolia) and Spike Lavender (Lavandula spica). This has not always been so. 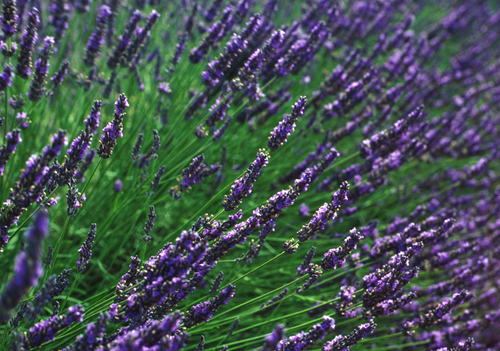 Prior to the WWI era, Lavender oil was mostly produced from wild plants in the French and Italian Alps. Given the poverty of the soil at higher elevations of Provence and the dire economic situation after WWI local farmers looked for a crop that could produce extra income. They found that cash crop first in Lavender and soon thereafter also in different Lavandin hybrids. The history Lavender and Lavandin cultivation on the plateaux of Provence is a fascinating story that tells us much about the often mysterious or serpentine interactions of people and aromatic plants. Among the different Lavandins, Lavandin super is the most easily accessible and useful one. Its high content of the calming linalyl acetate (an ester component) gives it a soothing quality, without taking away a very mild tingle. The oil is very useful as a calming and anti-inflammatory component for blending, that can be used in larger proportions due to its favorable cost. It is also a good oil to use in the shower, it can be splattered over wet skin for an immediate sensation of well being. Further reading in Healing Intelligence of Essential Oils: Lavandins in Provence, page 88. Lavandin in the Shower page 125. This is an exclusive members-only PIAOnline feature.